Ben’s Devon Steak Pasties are Coming! As some of you might know, our pasties are no longer available through the veg box scheme. This has absolutely nothing to do with the name change and was a decision we took in order to concentrate on supplying the shops with a wider range of better, more interesting, products. At one stage a couple of years ago we were supplying both Venus Cafes and Riverford and it was all hands to the pumps. Everything was done to a price and a spec so making even small improvements was incredibly tedious. The pastry suffered; because we had to make so much at a time it was over worked and bore no resemblance to the rough puff we used to make with grated butter and fat. A series of kitchen managers who had only ever worked in big factories didn’t help either. Now our first aim is to produce an organic, all butter, shortcrust X rough puff pastry for pasties, various tarts (including Portuguese custard – also in development) and selling as pastry in the shops. 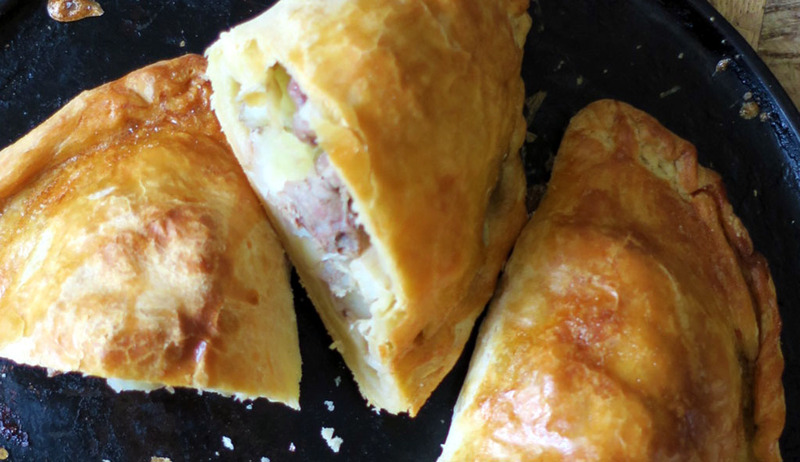 The first batch of BEN’S Devon Steak Pasties is scheduled for later in the week but it will probably be a while before they go into full production so, in the meantime, I thought you might like to make some yourself. Pasty making has never really been my thing but recently I’ve enjoyed experimenting with them so much that I’m right on it. I can’t think of anything else where the total is so much more than the sum of the parts – a bit of swede, potato, onion, beef chuck or skirt, flour, butter, water, salt and pepper and you have a meal fit for a king (or tin miner) and perfect for a summer picnic. The test for a good pasty is that it should be as good cool as straight out of the oven which makes them ideal for trips to the beach. Prepping the veg and making the pastry takes a while but once that’s done you can make them in minutes. Pasties freeze well; either raw, partly or fully cooked so it’s worth making in quantity. I could write a whole list of dos and don’ts but apart from urging you now to mess around with the ingredients they’re mainly common sense and I’m not a school teacher so click here for my recipe.